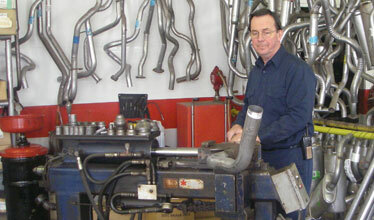 Our staff has over one hundred and twenty years of combined experience. We keep a large inventory of parts on hand so if you need it we likely have it on the rack. If we don't stock it there's a good chance we can build it and if not we'll get it fast! Have you ever got the feeling when you phone some places for car services that you might as well try to get an audience with the Pope. Not here. We're open from 8:00 to 5:00 Monday thru Friday. And we take jobs on a first come first served basis. Most regular jobs can be handled in an hour or less.